35,2 x 70,6 cm - 14 1/8 x 28 1/4 in. Albret Hecht, Paris, 1924 – Mme Albert Hecht (sa femme) jusqu'en 1924 au moins - Suzanne Hecht [Mme Emmanuel Pontremoli, Paris, 1939- 1956|selon Lemoisne 1946] – Mary et Leigh Block, Chicago, 1967 – The Art Institute of Chicago, 1981 (Don May et Leigh Block). Paris, galerie Georges Petit, 1924, n° 113 – Washington, Los Angeles, 1967, n° 6 – The Art Institute of Chicago, 1984, n° 31, repr. p. 72 – Detroit, Philadelphie, 2002- 2003, fig. 183, repr. p. 165 (Detroit seulement) - Fort Worth, Kimbell Art Museum, 2008, cat. 40, p. 91 (repr.) 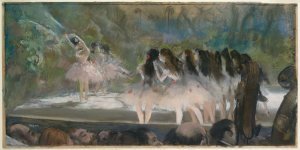 - The Art Institute of Chicago, 2015-2016, Degas : At the Track. On the Stage (Sans catalogue). Lemoisne, 1946-1949, II, n° 513, repr. p. 285 – Boggs, Burlington Magazine 110, juillet 1968, p. 429-430 (repr.) - Lassaigne, Minervino, 1974, n° 724, repr. p. 120 – Shackelford, Cat. exp. National Gallery, Washington, 1984, p. 30, fig. 1.6 - San Francisco, 1986, The New Paintings 1874-1886, p. 204 - Brettell, 1987, p. 20-22, repr. 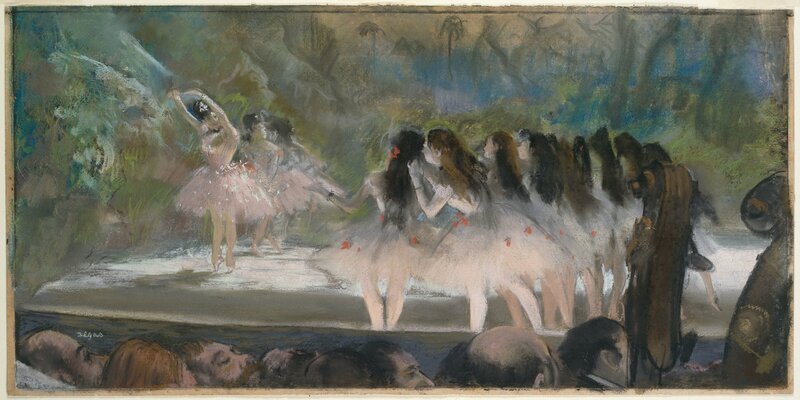 p. 117 – Boggs, Maheux, 1992, Degas Pastels, p. 52 (repr.) – Wood, May, The Art Institute of Chicago : The Essential Guide, 1993, p. 214 (repr.) - Boggs, 1996, p. 30-31, repr. p. 82, p. 108, pl. 11 - Wood, 2000, p. 49 (repr.) - Wood, May, The Art Institute of Chicago: The Essential Guide, 2003, p. 214 (repr.) - Benedetti, Cat. exp. Classico e Moderno, Complesso del Vittoriano, Rome, 2004, p. 233.